Real-time visualization by MARIN and SME partners, Cruden transverse sections and the impact force development of advanced computational and simulation technology and TreeC, as part of a CODEMO project of each of the sections is determined methods such as PANSHIP. 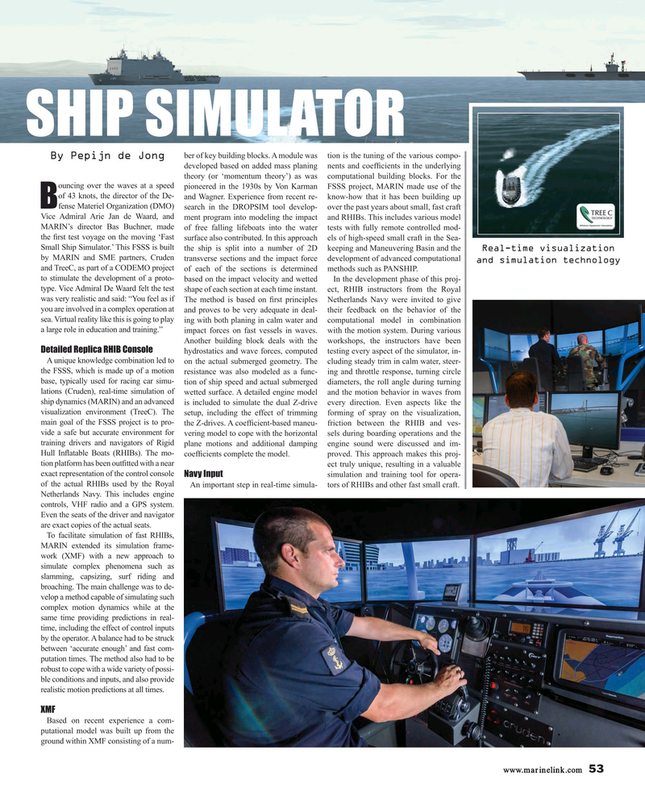 An important step in real-time simula- tors of RHIBs and other fast small craft. Netherlands Navy. This includes engine controls, VHF radio and a GPS system. Even the seats of the driver and navigator are exact copies of the actual seats. MARIN extended its simulation frame- work (XMF) with a new approach to simulate complex phenomena such as slamming, capsizing, surf riding and broaching. The main challenge was to de- velop a method capable of simulating such complex motion dynamics while at the same time providing predictions in real- time, including the effect of control inputs by the operator. A balance had to be struck between ‘accurate enough’ and fast com- putation times. The method also had to be robust to cope with a wide variety of possi- ble conditions and inputs, and also provide realistic motion predictions at all times.